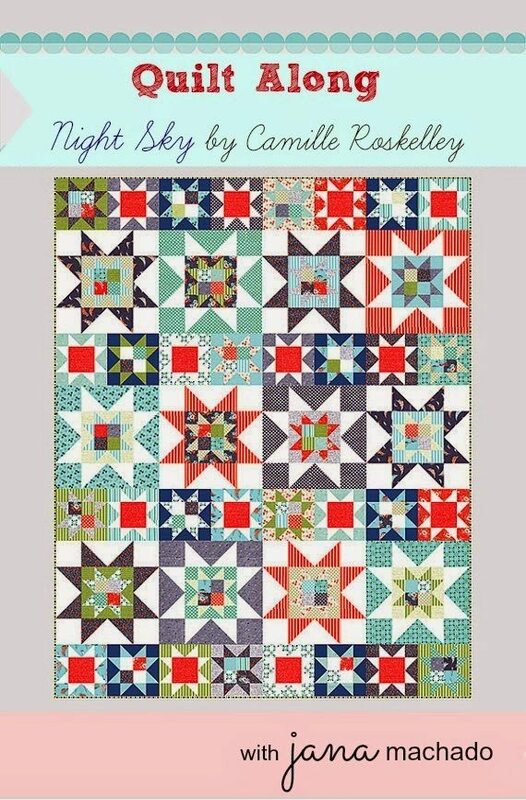 Camille Roskelley has released a new pattern called Night Sky and Jana Machado is hosting a QAL so we can all join in and make this gorgeous quilt. Information about the QAL can be found here. Visit their blogs to see versions of the Night Sky quilt coming together in an assortment of different fabrics and styles. I chose solids for my stars and assorted grey prints for the backgrounds. 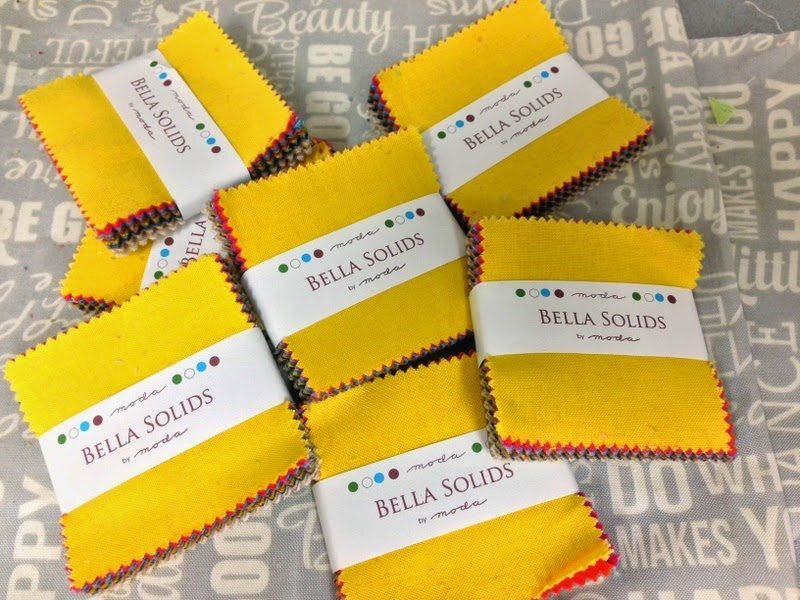 In my Moda Shrine (cupboard full of moda fabrics), there was a stack of Bella mini charms and a 5″ charm pack of rainbow solids. I used the 2 1/2″ mini charms for the 4-patch star centres and the star points. 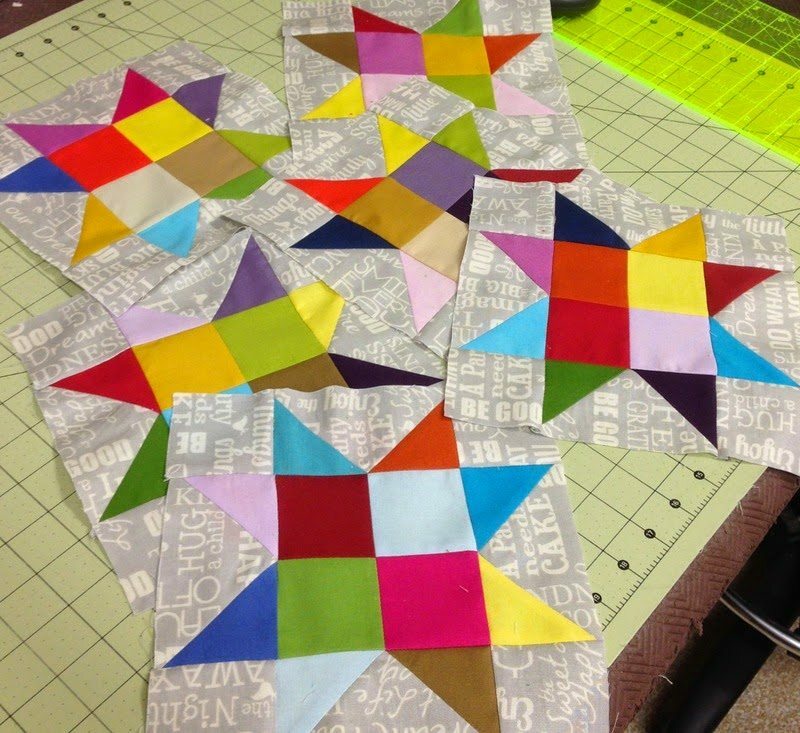 The centres of the remaining small stars and the larger star points were cut from the 5″ charm squares. I did not want to waste half of the charm square using the method shown in the pattern so I used the nifty Folded Corner Clipper ruler to trim the background rectangle and cut the 5″ charm once on the diagonal to yield 2 corner triangles. My quilt will double as this years teacher’s quilt so I only made a portion of the complete quilt (approx. 48″ x 56″). My lovely, tall son is holding up the finished quilt top which will be pressed, quilted, bound and labeled before friday. 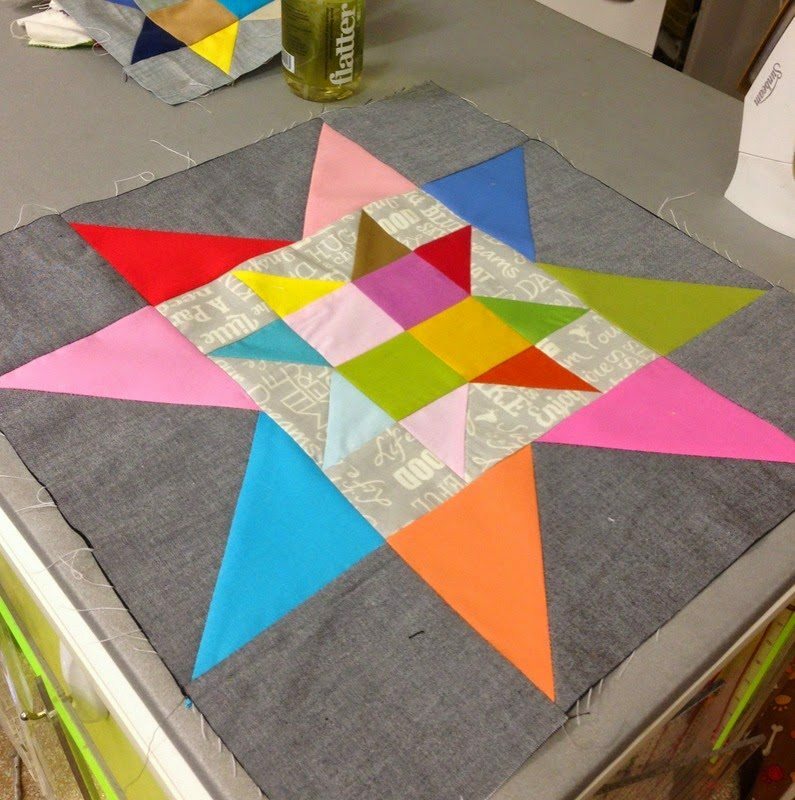 Thank you Jana for inviting to play along with you in the Night Sky QAL. Night Sky is the pattern of the month at FQS and as part of the Night Sky QAL blog hop, Fat Quarter Shop are having a giveaway of a fat quarter bundle of Miss Kate. « More birthday blocks have arrived. 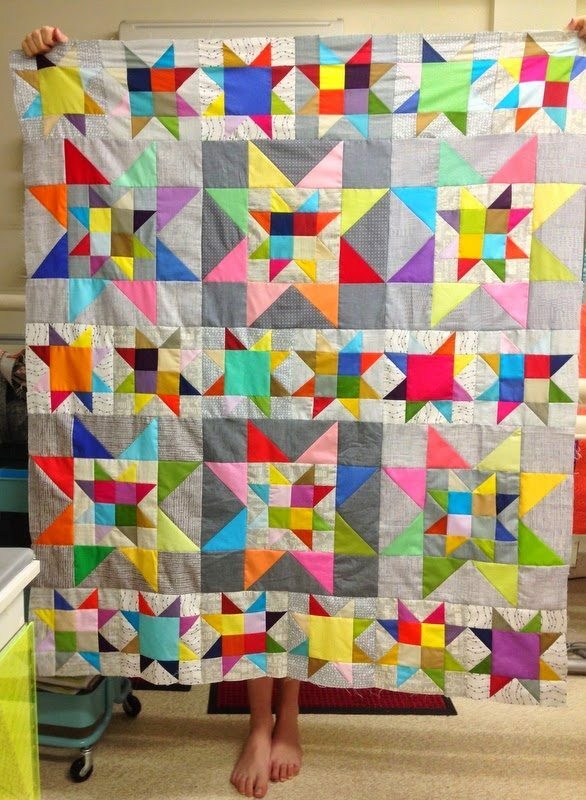 It is a gorgeous quilt, so bright and happy. I always always love your choices of colours and designs….. so bold and happy… lucky teacher! Wow Jane! It looks so modern and fun! I'm so glad you played along! When I invited some quilters I was so looking forward to see each one's choices! 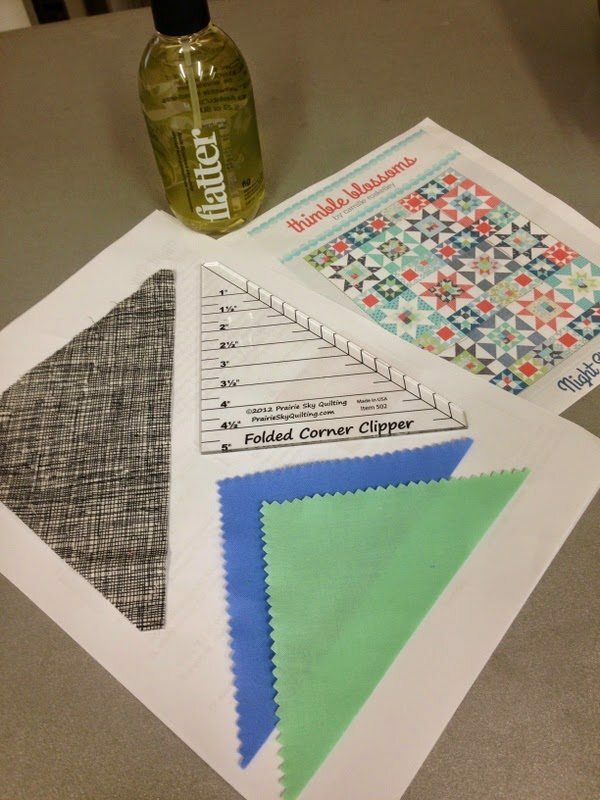 I just learned about the ruler Folded corner clipper, it definitely helps not to waste fabric. Thank you so much! What a beautiful quilt Jane! Lucky teacher. I am only doing one teacher quilt this year and opted for an extremely simple design. As in horizontal strips of fabric! Love the grey background fabrics with the solids. I really like it!!! I might have to copy. I saw this pattern when it came out and kept telling myself I don't need it. I think I need it after all!!! I love the gray background.